While the Golden Globes do not automatically lead to Oscars (Red, The Hangover, Rush, etc.) they do signal the start of the awards season. Even though every year I dread looking at the curveballs they will throw, I still end up spending way too much time talking and writing about them. So without further ado I’ll congratulate the HFPA for sucking me back into this mess and share some of my initial reactions of today's nominations. Carol walked away this morning with the most nominations (five) followed by The Big Short, The Revenant and Steve Jobs (four each). Despite this Steve Jobs was the only film of the four that did not receive a best picture nomination. Too bad Aaron Sorkin could not add a musical number to qualify it for a comedy/musical spot. Speaking of musical/comedy, the best picture nominees included The Big Short, Joy, Spy, Trainwreck, and…The Martian? While the Globes are known to bend rules to include certain works and actors (The Tourist) this one had me scratching my head. While so many movies and shows have elements of both nowadays, Paul Feig said it best when he tweeted “a comedy's a film whose #1 goal is to make people laugh. If that wasn't the filmmakers' top goal, it's not a comedy." While I have yet to see Joy, I don’t think Matt Damon’s solo struggle on Mars was supposed to be hysterical. As for other movie nominations I’m sure many expected to see more love for Bridge of Spies and The Hateful Eight, which both failed to receive a best picture or director nod. Others may have hoped for nominations for Straight Outta Compton or Creed. I’m still surprised that Johnny Depp was snubbed for Black Mass, especially after being nominated for The Tourist (yes, that is the second time I brought The Tourist up). As stated above, the Globes are known for the stars they try and sneak in to the ballroom so the absence of Depp and Tom Hanks left me curious. However, they did manage to nominate Mark Ruffalo for playing a manic-depressive father in the “comedy” Infinitely Polar Bear instead for the drama Spotlight. Moving over to television Netflix had a great morning with eight total nominations followed by HBO with seven. Despite airing the ceremony, NBC failed to receive one nomination including for the farewell season of Parks and Recreation. I was ecstatic to see some love for Crazy Ex-Girlfriend’s Rachel Bloom, Fargo’s stupendous second season and the surprise freshman drama Mr. Robot. 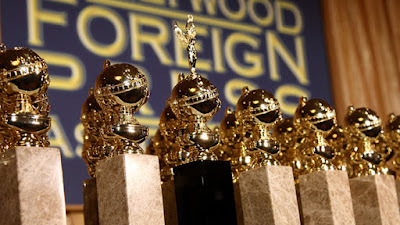 Like the globes themselves the HFPA love shiny and new things. The last three years of comedy series winners (Girls, Brooklyn Nine-Nine and Transparent) all won for their first season (or the first half of their first season). This year the comedy series category is still full of surprises. Four of the six nominees are from streaming services in a category without one network show! Casual and Mozart in the Jungle’s surprise nominations allow them to join Emmy favorites Orange is the New Black, Silicon Valley, Transparent and Veep in this category. Last year’s drama acting winners Kevin Spacey and Ruth Wilson are also absent this year yet Jon Hamm is back after two years of being snubbed. However, Mad Men failed to earn a drama series nod for their final season. Instead freshmen series like Mr. Robot and Narcos earned spots next to Empire, Game of Thrones and Outlander. Like most awards shows the Globes are nearly impossible to predict but that won’t stop me in the coming month to do just that. Be sure to keep a look out here and on iTunes for future podcasts where I keep diving deep into these nominees and predict the winners. Until that podcast hits be sure to let me know who you think was snubbed or deserves to win a trophy on January 10th!